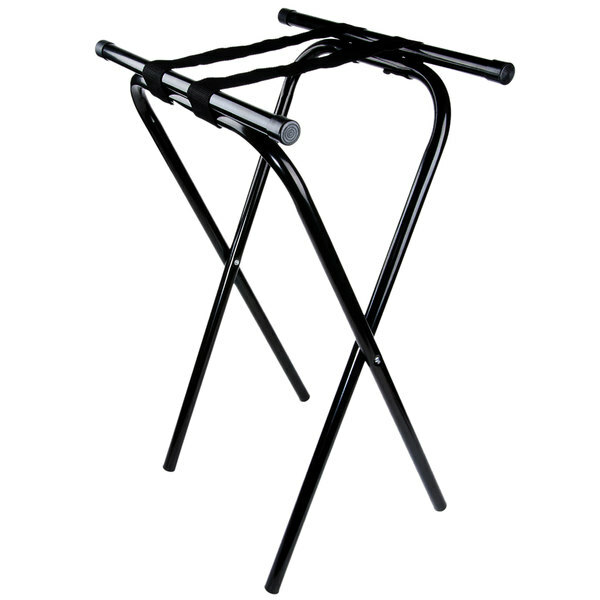 This Lancaster Table & Seating black metal 31" tray stand features extra long top bars for maximum support and stability! Its space-saving folding design flips open easily to provide stable support for large trays of food. This restaurant tray stand allows your waiters to quickly and efficiently serve their customers without the fear of spills and other mishaps when serving large, heavy orders. It boasts a convenient 31" height that makes it ideal for convenient table side service, and rubber feet that protect your floors from scratches and scuffing while providing added slip resistance and stability.